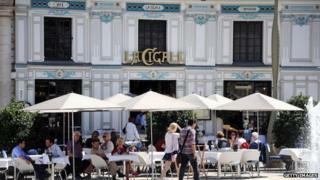 Eurozone business growth slowed in August, weighed down by sluggish French and German economies. The latest Markit Composite Purchasing Managers' Index (PMI) fell to 52.8 from July's 53.8. A reading above 50 indicates growth. In France, the service sector expanded faster, but manufacturing shrank, to give a reading of 50, slightly up from 49.4 in July. In Germany, the composite index fell to 54.9, from 55.7 in July. The eurozone's timid performance may fuel calls for the European Central Bank to act to inject more life into the euro bloc. "We are not seeing a recovery taking real hold as yet. We are not seeing anything where we look at it and think 'yes, this is the point where the euro zone has come out of all its difficulties'," said Rob Dobson, senior economist at Markit. He added: "Even before rising geopolitical headwinds began to buffet the economy, the double-digit unemployment rate prevailing in the eurozone was already excessively high. Signs are that the modest job creation of recent months has stalled in August," he said. Oliver Kolodseike, another Markit economist, said that although Germany's service sector grew, manufacturing had lost further momentum this month. Official figures showed that the German economy shrank by 0.2% between April and June, its first quarterly contraction in more than a year. However, Mr Kolodseike said he still expected Germany to return to growth in the third quarter.